SKU: 35CP. Categories: Cellophane, Cellophane Rolls, General Purpose, Gift Packaging, Paper & Cardboard, Plastics. Tags: Christmas, Craft, Free Shipping, Gift Wrapping, Presentation, Presents. 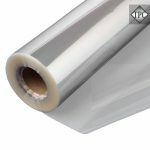 Make a crisp and clear impression with this clear dot patterned cellophane as a wrapping for christmas gifts, hampers and other presentations throughout the year. The plastic is also breathable making it is suitable for wrapping flowers.